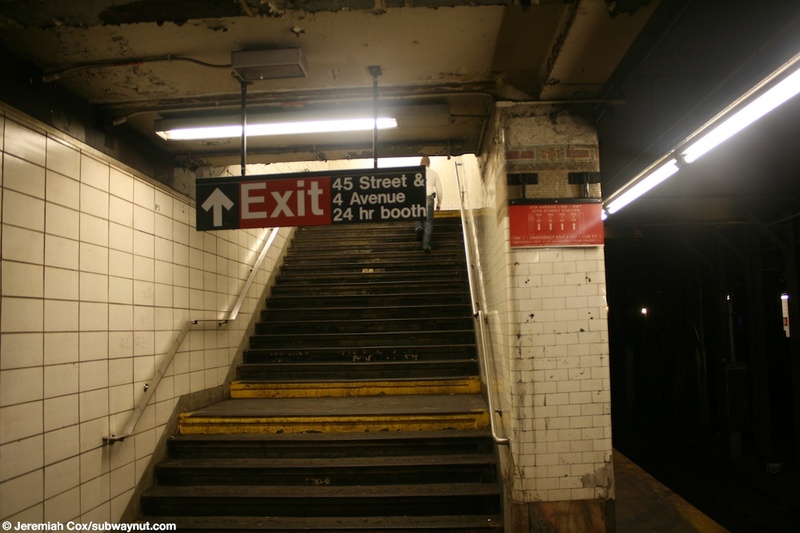 There is a closed exit to 46 Street (all the local stops south of here still have this High Exit Turnstile exit open) towards the middle of the Bay Ridge-bound platform. 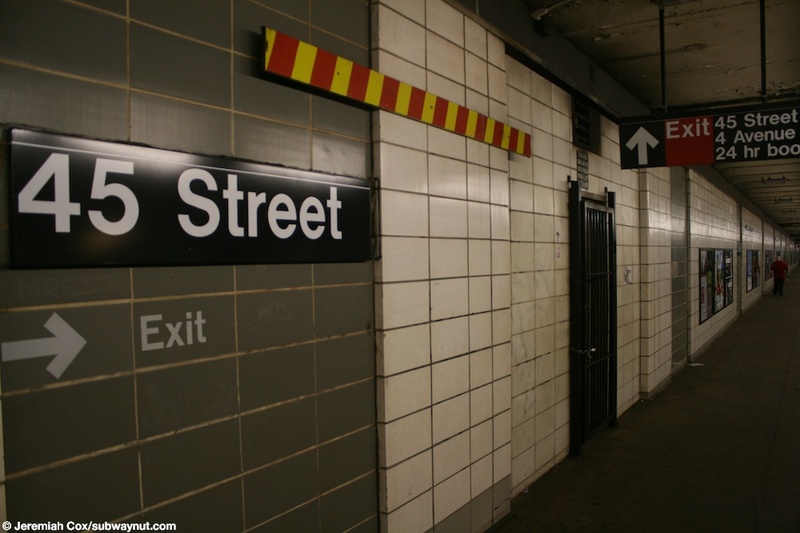 Evidence of it is by a door in the walls, and more importantly that south of the sign all the painted text on the platform columns simply say exit, while in between this closed exit and the main one arrows say 45 St next to them and painted over arrows formerly said 46 St. 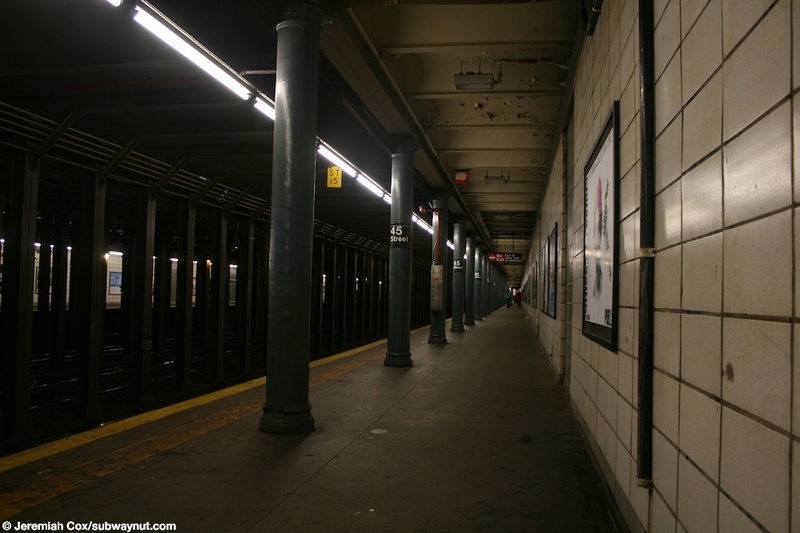 Both platforms also have columns along their platform lengths, all are painted blue and are round for most of the platform's length except towards the end where the platform was extended to accommodate ten-car trains and those are the standard I-bean ones. These columns all have 53 Street signs on them. 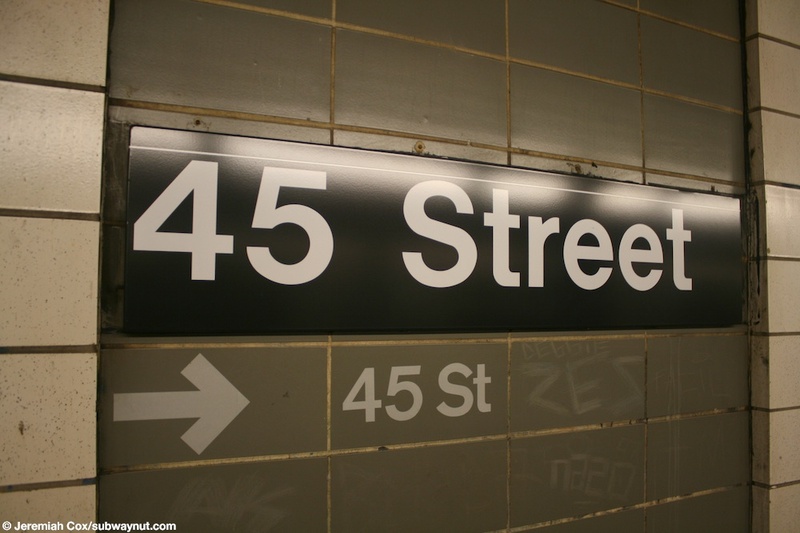 A 45 Street platform sign, text and an arrow for the only exit to 45 St painted beneath it. 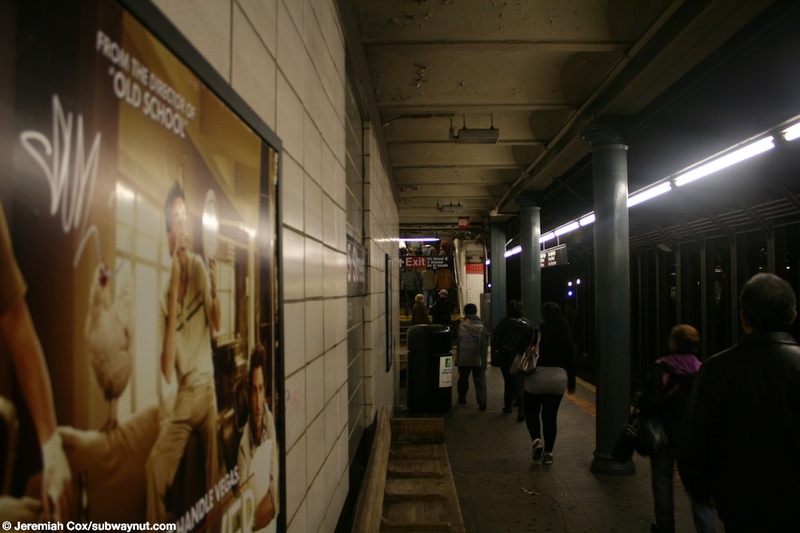 Passengers approach the single staircase up to street level at the extreme northern end of the Bay Ridge-bound platform at 45 Street after getting off a rush hour R train. 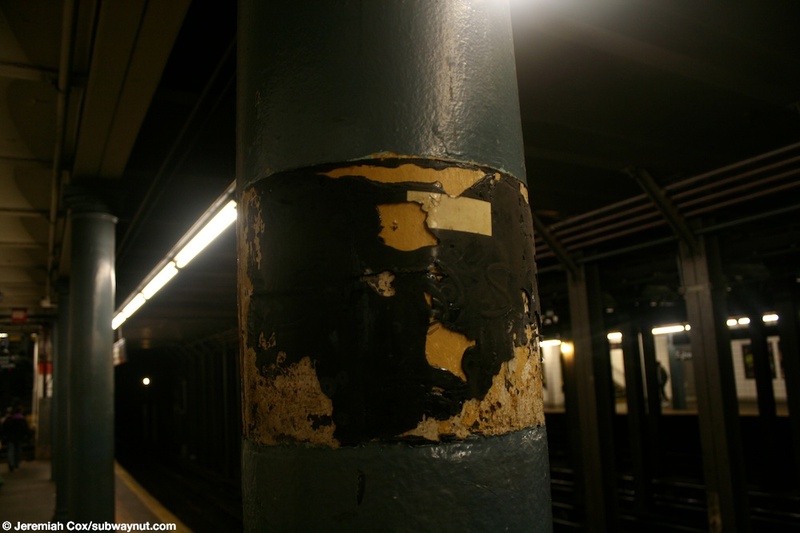 Peeling paint on a column at 45 Street, probably a column sign used to be afflixed here. 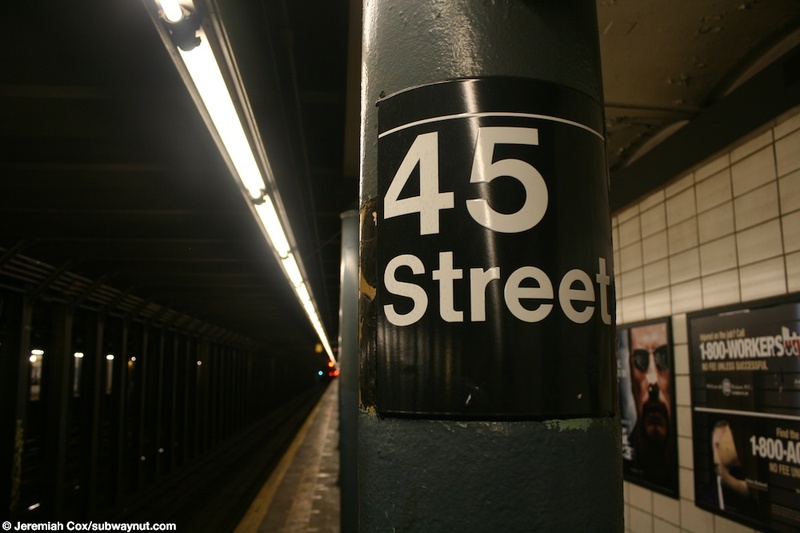 A standard 45 Street column sign. 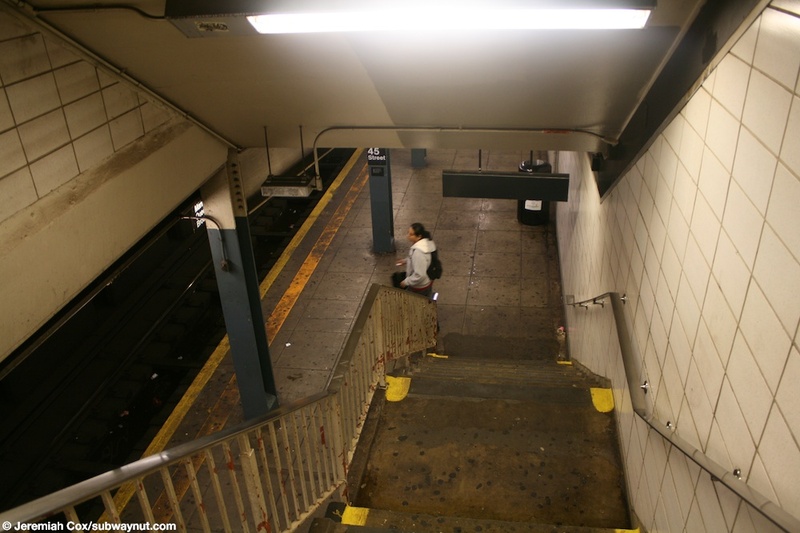 Approaching the single staircase up to street level from the Bay Ridge-bound platform at 45 Street. 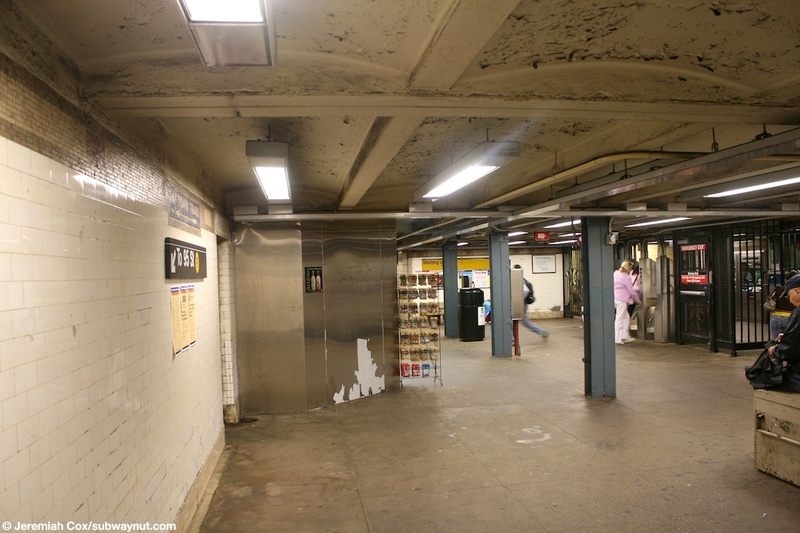 The small mezzanine area with its turnstiles and a newsstand at 45 Street. 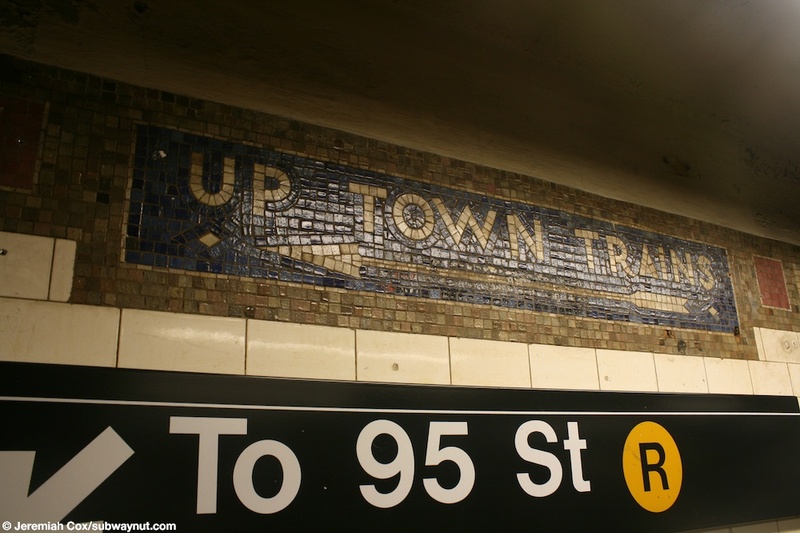 A mosaic sign for Up Town trains above a modern To 95 Street R sign at 45 Street. 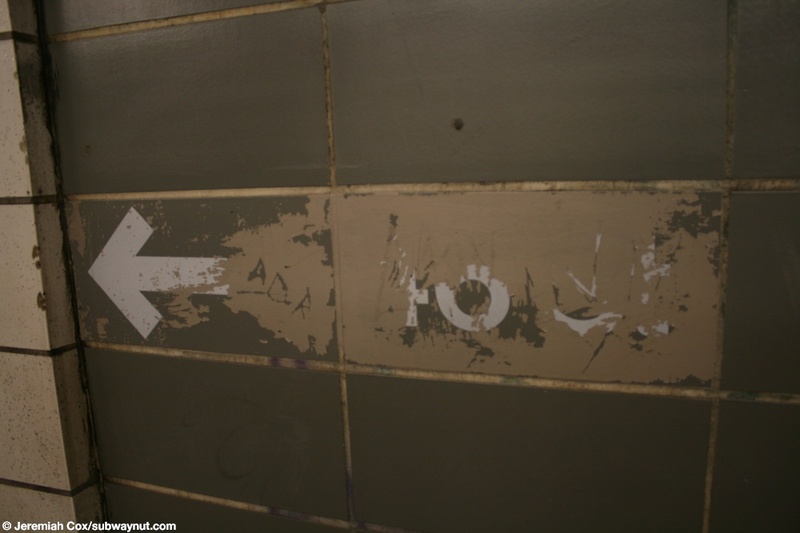 An old, blank terra-cotta sign above a door that probably led to a now closed restroom on the small mezzanine at 45 Street. 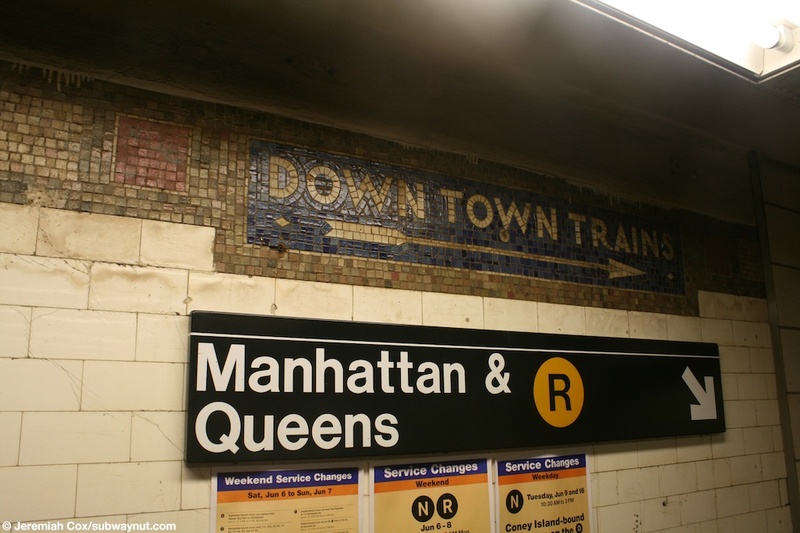 A Down Town Trains mosaic above a modern Manhattan & Queens R sign on the mezzanine at 45 Street. 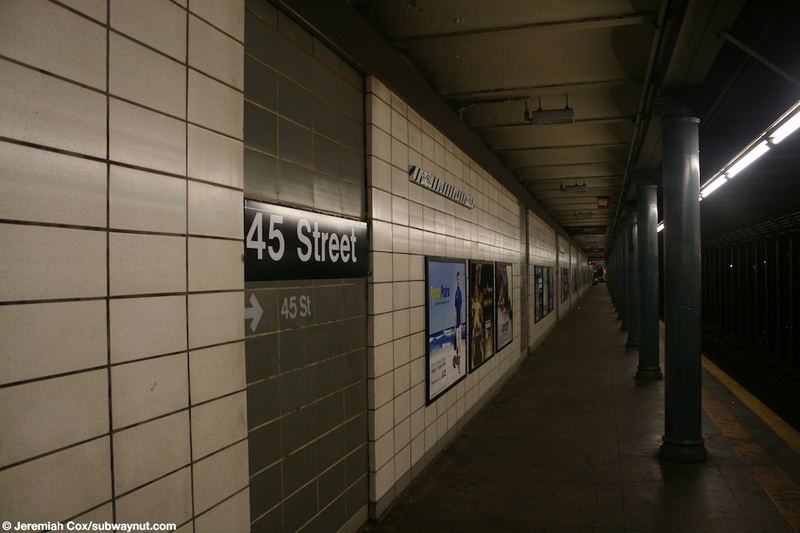 The passageway that leads to the two staircases down to the Manhattan-bound platfrom at 45 Street. 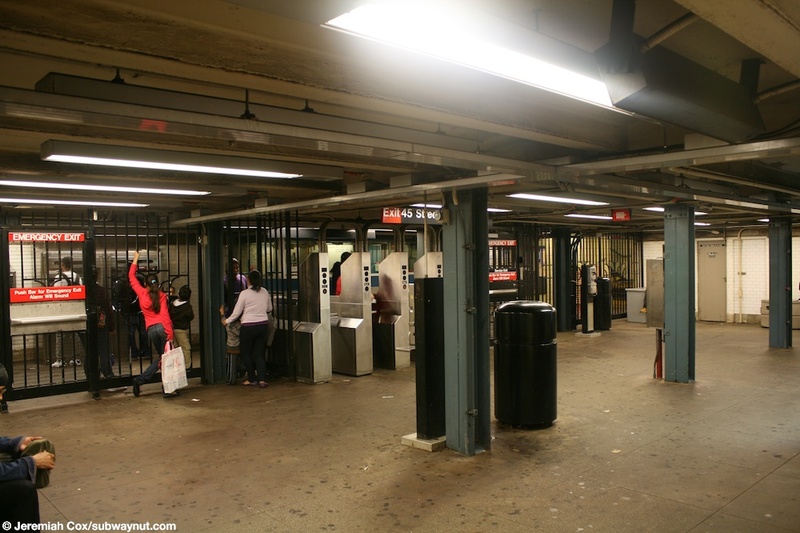 Another view of the small mezzanine area with its turnstiles at 45 Street. 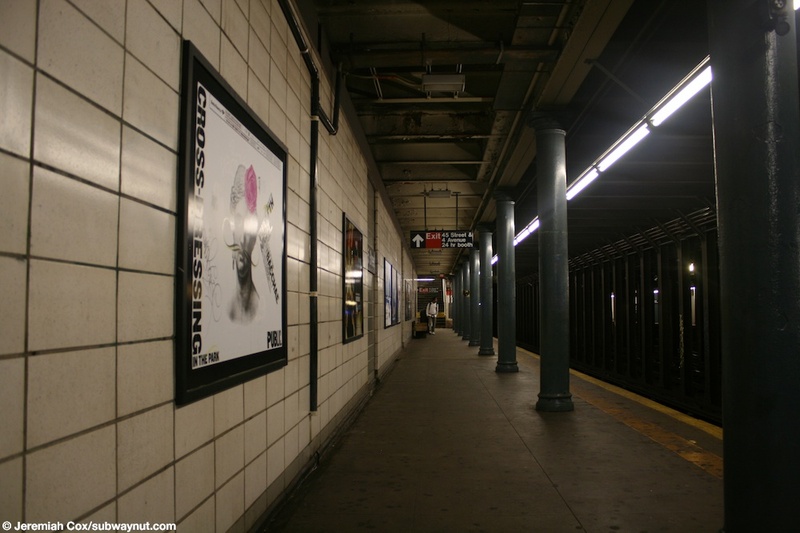 Looking down the single staircase to the Bay Ridge-bound platform at 45 Street. 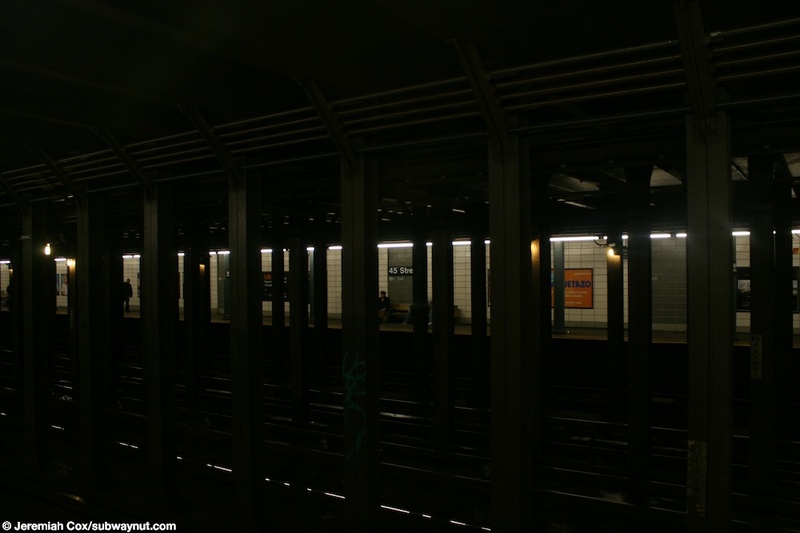 A view down the Bay Ridge-bound side platform at 45 Street. 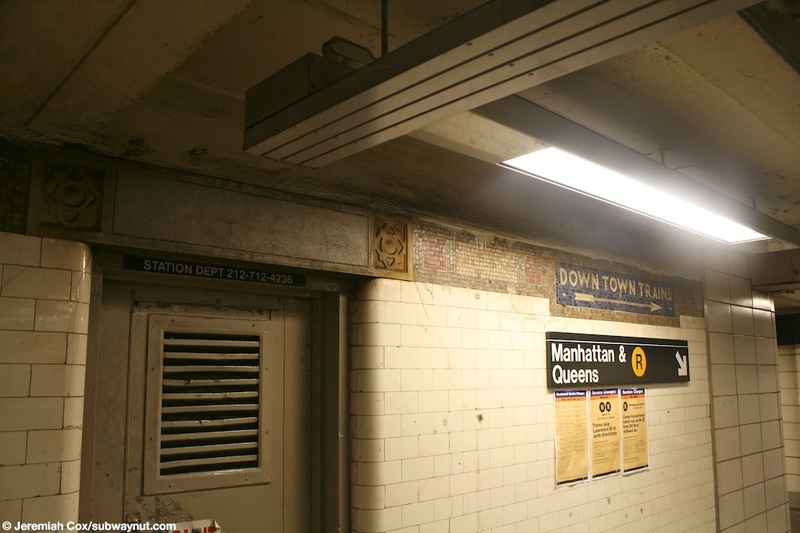 A bare grey column at 45 Street, the text that formerly pointed towards the exit to 46 St has been painted over. 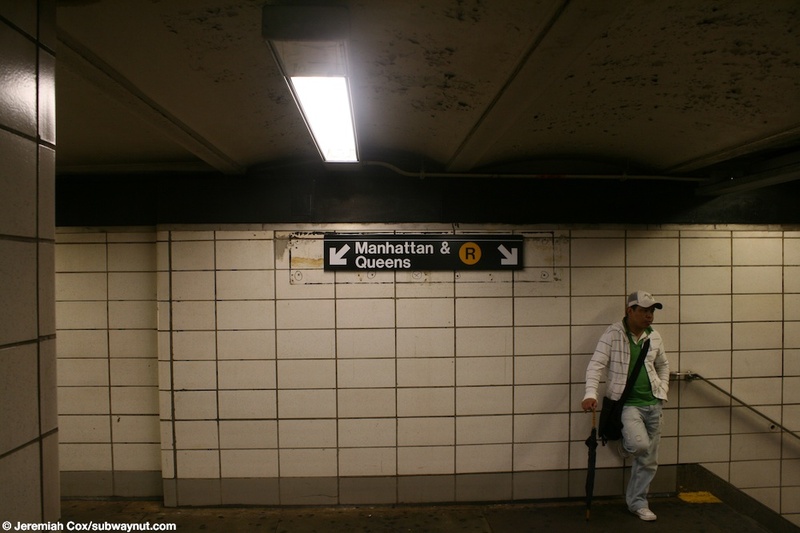 Looking across the four track subway to the Manhattan-bound platform at 45 Street. 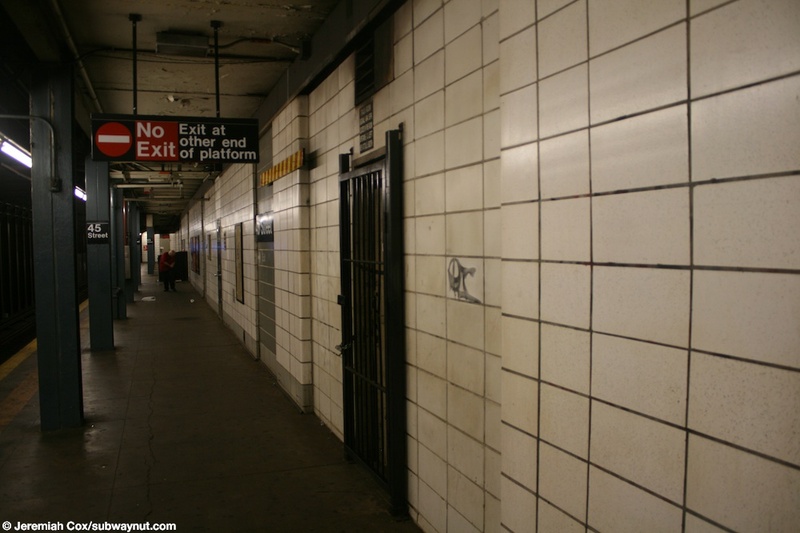 Another view down the Bay Ridge-bound platform at 45 St.
A gated door where a high exit turnstile to 46 Street used to leave the Bay Ridge-bound platform from. 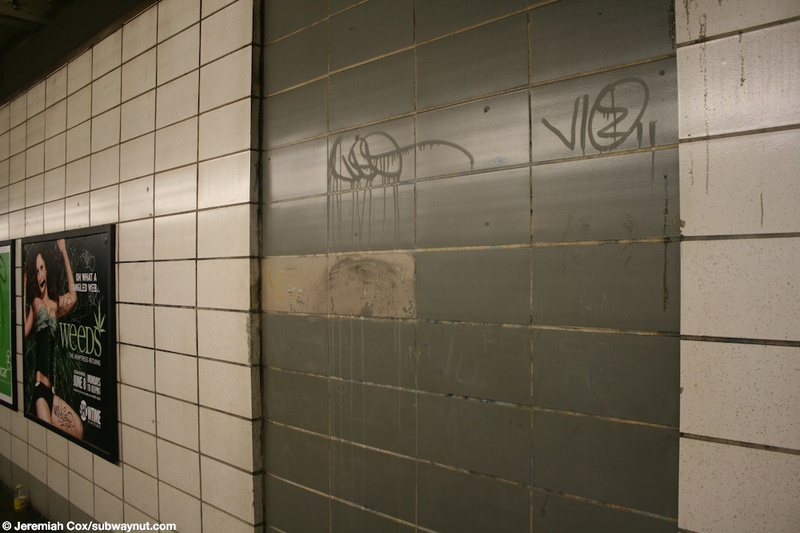 A close up of partially painted over text for the now closed exit to 46 St.
Another view towards the closed exit to 46 Street.